This picture is from Mike Pease, the co-chairman of the DCI-sanctioned Pageant of Drums event in Michigan City, Ind. At the Cavaliers' Pageant of Drums show in Michigan City, Ind., there are a lot of people we have to keep cool. 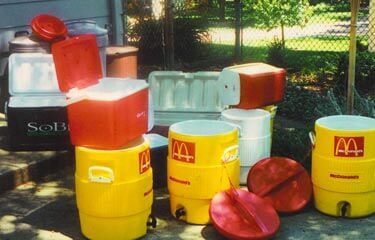 This is a picture of all the coolers, which are filled with water and soft drinks, that we use to keep the volunteers, judges, DCI staff and corps performers cool during the show. How many coolers can you count? Answer: 10.